NUNS WIN! NUNS WIN! Or at least American nuns no longer have a Vatican investigation hanging over their heads, anyway. Specifically, Rome was poking around the Leadership Conference of American Women Religious, a prominent American nuns’ group. Pope Francis’s predecessor originally launched the inquiry into allegations of—gasp!—CREEPING RADICAL FEMINISM. The plan was to do an overhaul. Many were worried the Vatican wanted to clean house (which would’ve been a hell of a note). The move was unpopular with many Catholics here in the States, given the decades of work by American nuns in Catholic-run schools and charities, as well as the occasional act of totally metal activism. Under the previous pope, Benedict XVI, the Vatican’s doctrinal office had appointed three bishops in 2012 to overhaul the nuns’ group, the Leadership Conference of Women Religious, out of concerns that it had hosted speakers and published materials that strayed from Catholic doctrine on such matters as the all-male priesthood, birth control and sexuality, and the centrality of Jesus to the faith. But Francis has shown in his two-year papacy that he is less interested in having the church police doctrinal boundaries than in demonstrating mercy and love for the poor and vulnerable — the very work that most of the women’s religious orders under investigation have long been engaged in. Basically the Vatican came out and said “We’re all good now!” without much in the way of details, which likely means they’re backing off, as Slate explains. They’ll have a doctrinal advisory committee to look over anything they’re publishing, the Guardian reports, but that’s far, far milder than what many feared. 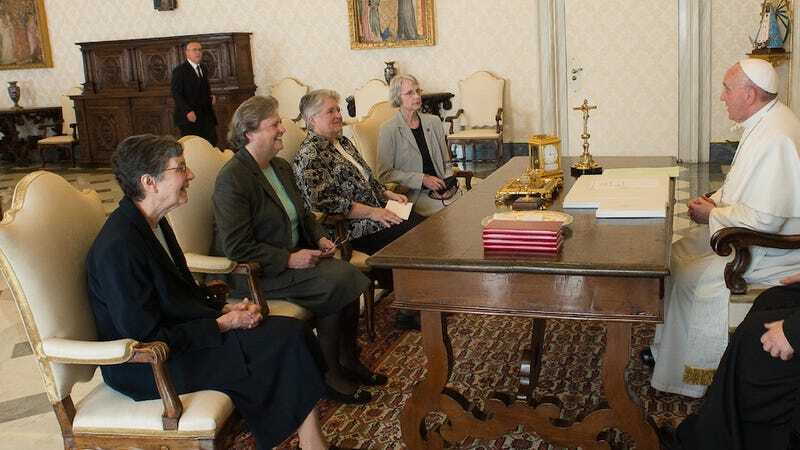 Pope Francis even met with four women from the conference for nearly an hour, and the Vatican released a smiley we’re-all-pals-here photo of the gathering. “It’s about as close to an apology, I would think, as the Catholic Church is officially going to render,” theologian Eileen Burke-Sullivan told the Times. This comes on the heels of the Vatican concluding back in December a broader look into the conditions of American nuns, with an acknowledgement that they’re holding it down despite their dwindling ranks. All together now: NUNS! NUNS! NUNS! NUNS!